The Character selection screen during Smashdown. Smashdown (全員バトル, Everyone Battle) is a multiplayer mode in Super Smash Bros. Ultimate. It consists of a series of matches, and after a character has been used in a match that character is not able to be chosen again until the series of matches is completed. It is one of three modes in the game's Special Smash mode, the other two being Custom Smash and Super Sudden Death. Each player chooses a different character and participates in a standard Smash battle. 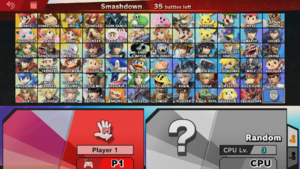 After the battle ends, the characters used disappear from the roster for the rest of the game. Mii Fighters are not available in this mode, and Echo Fighters are always displayed and counted as separate character from their parent, regardless of the player's display settings. Also, the number of battles played before the game ends can be adjusted, and enabling Mercy Rule will cause the game to end if a player has won too many battles for any other players to make a comeback. Replays can't be saved in this mode. The Rules screen in Smashdown. The victory screen in Smashdown. It has been compared to a Full Roster Ironman. The Super Smash Bros. Invitational 2018 indirectly featured this mode, as its main rule was that, after a player used a character, they could not use that character again. This is the only mode where two players can't be the same character. Smashdown is the only way to have a character select screen without Kirby on it, as he is the only character available at the start of World of Light, as well as a starter character. This page was last edited on April 21, 2019, at 21:15.